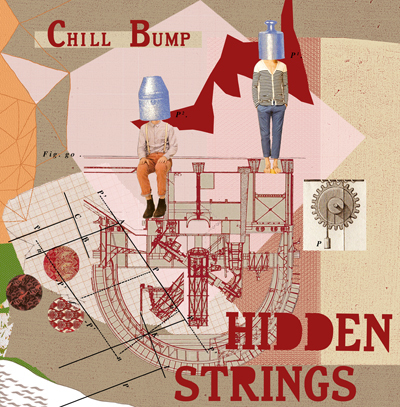 Chill Bump continued their streak of dope releases with the delivery of their third and latest EP,Hidden Strings early last week. Hailing from Tours, France, the rapper/producer duo composed of beat-maker Bankal and wordsmith Miscellaneous have enjoyed critical acclaim and gained a faithful following due to their polished DIY sound and their uncompromising approach to their craft. Hidden Strings is a follow-up to the duo's second EP, Back To the Grain which was released back in March of this year. In terms of quality, Chill Bump's new EP picks up where the last one left off. The socio-politically charged opening track "Life Has Value" sets the tone for the project. The beat, which includes a clever audio sample of Peter Finch's iconic"mad as hell" speech from the late Sidney Lumet's 1976 award-winning satirical masterpiece Network, highlights Bankal's well honed production chops and Miscellaneous lyrical versatility. The duo slows things down on the appropriately titled closing track "Five Minute Breather" which feature a beat with a broodingly mellow vibe. "Life has Value" and "Five Minute Breather" serve as the perfect bookends for Chill Bumps solid five track EP. While the EP is available for the nominal fee of an email address and zip code, the duo's latest effort is surely worth a couple of your hard-earned dollars/euros. Follow the download link below to head over to Chill Bump's Bandcamp to name your price for their Hidden Strings EP.